Yes, time is ticking down on our departure date. Rapidly. But this weekend, I had to step back and appreciate the time I have to live this dream. It had crept into my conscious thought that I hadn’t chatted online with my friend Andi in awhile. 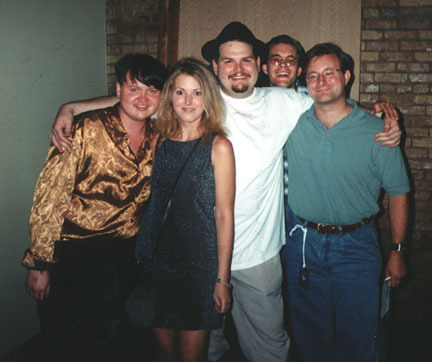 I met Andi in 1999 at the first American concert by one of our shared favorite bands, Alphaville. We knew of each other via the band’s email list, and we became casual friends upon meeting in person. A couple years later I happened to be chatting with her online while listening to the soundtrack for Waking Ned Devine, and threw out a cavalier and half joking invitation to go to Ireland. Next thing I know, we were meeting in London, then off to Germany for an Alphaville concert where we had full back stage passes, free admission, and were driven to the show by the band’s manager. The next morning I ended up having breakfast with the lead singer and two other fans, and it remains one of favorite experiences. For those of you reading this that don’t know me, I live in Seattle, and Andi live quite a ways away, in Cincinnati. I saw her again in the early 2000s when I was on a business trip to Ohio and she came up to visit. We have stayed in touch via text, online chatting, the occasional phone call, and recently I had spoken with her a lot via Facebook. We shared a love of 80s synthpop music, mostly Alphaville and Duran Duran, and we both are very much cat people, her recently getting a new kitten named Sake, and me with the familiar to my readers Minion. As I realized I hadn’t heard from her, I sent a text message asking how she was, and a day later, looked her up on Facebook and started reading the comments on her page. I think I realized what the first one I read meant, but I continued reading telling myself people were commenting that they missed her because she was ill and not going to work or had moved to another job, something, anything but the truth that was sinking in. Andi passed away a couple months ago in mid June. My guilt over not finding out sooner is tempered by her being a distance friend that I had often gone months without communicating with, but it had been more frequent shortly before she passed away. I sent an apologetic but questioning email to someone on her friends list who shared her last name, and received a quick reply from her niece letting me know Andi’s passing had been unexpected and apparently fairly quick, coming from a heart attack caused by a blood clot while she was undergoing some medical testing. Andi had survived Lymphoma as a teenager, and I know her health wasn’t that of most people’s, when we traveled together she would occasionally opt out of walking up a steep hill or other strenuous activity as she didn’t have full lung capacity. But I never heard her complain about her condition or bemoan her position on life. She didn’t hold me back traveling, several times offering to sit on a bench and wait for me to complete an exploration she didn’t feel she could accompany me on. She was sweet and kind, and made the most out of our trip, urging me on when I wound out our little Ford Focus on the Autobahn, laughing for years about Mercedes full of German girls that waved at me, even though neither of us had any idea why they were waving. While I’m preparing to set sail on my life’s dream, Andi’s time ran out, much much to soon. I have my fears about sailing the open ocean, but I get to face those fears and create new experiences and memories. But my current memories will always include Andi, as she was a lesson about making the most of your life, whatever is handed to you. No, she wasn’t Lance Armstrong winning cycling races after cancer, she was just another regular human being living life, but doing so joyfully and without complaint. Most of us are just regular people, and she stands out as an example to me of living your life and having joy in it. RIP Andi – I will carry your memory wherever I go, saddened that we can’t discuss our shared loves and that you can never come visit me on my voyage, but grateful your joy touched me and doing my best to carry a love of life on in your memory. I was saddened to see the news of Andi’s passing. I read your blog and I’d like to say you did her justice. I remember back to July 99 and that time we all got to share together. I’ll try to check in on your blog every now and then. Good luck on the trip. This is so sad, I knew Andi very well, but haven’t been in contact with her for some years. I knew she had serious health problems, but I always thought she would overcome this, so sad she’s gone, she was a very nice and kind person, she told me stories about how the songs of Alphaville helped her through the rough times at the hospital. Mark, do you or Erlin have contact with her family? I have some pictures of her I’m sure they don’t have, maybe I could mail those to them…?